B29 Peak at Argosari in Lumajang, east java, Indonesia is one of the highest peaks in Mount Bromo National park trekking route. This summit located in Senduro Argosari Village in Lumajang subdistrict and included in National Park Bromo Tengger. The altitude of the peak is 3.676 meters above sea and likely same with mount semeru elevation. This is one of the most favorite places to enjoy the Mount Bromo view beauty. Peak of B29 hill is located in southeast side from Mount Bromo and about 40km from Lumajang. It is also known as the best trekking route in java island, Indonesia. 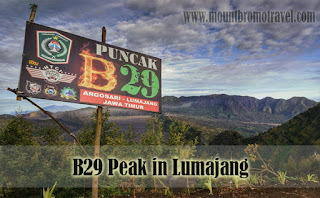 The term of Lumajang B29 it comes from the location that altitude in 2900 mater above sea level. To reach B29 Peak in Lumajang, it is available to start from Mt Bromo Cemoro Lawang trekking, it is located in Ngadisari village or from Senduro, at Lumajang District. For you that start the travel from Surabaya airport, it is available to take Trekking to B29 Hill that most similar with Mount Semeru Trekking where you can find the road condition that little bit winding and steep. It is much recommended to use trekking shoes and stick. You will find the winding road and quite along the slopes of Mount Semeru to district from Senduro. You will pass the rural feel that lead to the Village Argosari. From this village, there is path walk that easy to follow tih paved goon condition. 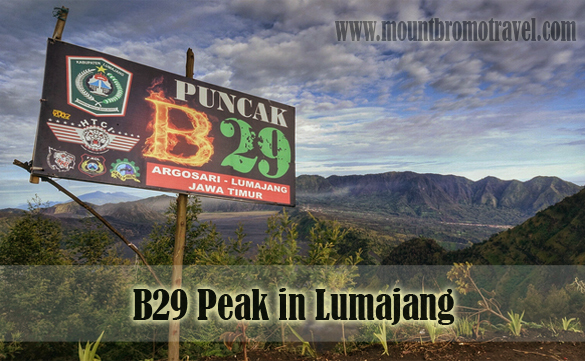 The B29 Peak in Lumajang presents the awesome nature tour that you can see around the village during your trip to the summit. There is various vegetables farm that look nature in its circumstance. When you reach B29 summit, there are two beautiful nature views that you can see. First is the Argosari plantation that located in Semeru mountain line and Mount Bromo tourism area that includes the whispering sands with white cloud spreading out that cover Bromo Mountain when the sunrise shining. When the sunset confronts appears to B29 summit, it seems awesome for everyone. When you travel to B29 summit, do not forget to take further travel around and enjoy other interesting places such as Madakaripura waterfalls, Mount Semeru Trekking tour, Mount bromo tour, and Kumbolo Lake trekking tour. When you go to B29 summit, make sure your tour package is equipped with additional safety devices such as light, and be careful when walk after rain fall because it could be so slippery when visit the B29 Peak in Lumajang.